As we drove through the outskirts of Metro Manila on our way to the city of Tagaytay in Cavite province, we passed seemingly interminable rows of fruit stalls along the side of the road. Even as we sped by too fast to take decent pictures with my perky little Canon, I could spot such familiar fare as bananas, pineapples and young coconuts among the abundant offerings. What really caught my eye, however, were the giant, benubbed, mottled-green pods propped up against table legs and stall posts, some cut in half to display a ghostly white inner core. "What are those?" I asked my mother, my voice tinged with alarm at spying such an alien mass. Despite the blurred scene out the car window as we whooshed by, she knew exactly what I was referring to. "Oh, those are langka," she replied nonchalantly. What? Those freakish, monster things are langka - jackfruit? The stuff I put in my banana turons just weeks ago, posted on this very blog and actually ate?! My shocked reaction seems absurd now but I had reason: the ponderous produce displayed at those roadside stands bore no resemblance to the mango-y, syrup-drenched, fist-sized fruit that I thought I knew so well. But they are indeed one and the same. The jackfruit tree (Artocarpus heterophyllus) originated in India and eventually spread throughout Southeast Asia as well as parts of Africa and coastal Brazil. Its eponymous fruit is the largest tree-borne variety in the world, growing as long as 3 feet and weighing close to 80 lbs. In short, my friends, this is one fruit tree that you don't want to shake. Newton should be grateful he didn't fall asleep under one of these behemoths. On closer inspection, it's starting to look more familiar . . .
As embarrassing as it is to admit, I had no idea what an actual jackfruit looked like. My sole point of reference were the pictures on the canned variety, none of which portrayed the whole fruit, much less give it a sense of scale. Call it the "Tragedy of the Common Canning" - the process necessary to preserve fruits, vegetables and animal proteins in hermetically-sealed tinplate renders them virtually unrecognizable from their original form and has left generations of consumers in the dark about what their food really looks like. "[C]ustomers of the prairies of the [American] mid-west or in the urban slums of Manchester had no access to, and had probably never even tasted, the fresh product, and so were ready enough to welcome the canned versions, which added much-needed variety to the diet. " Jackfruit trees, for instance, grow well only in tropical climates and its ripe fruit decays rapidly; as a result, there are only a few such trees in the continental United States (in Florida and California) and the market for its fruit must rely on canned products from Asia. Throw in marketing strategies that probably argued fervently against depicting an enormous mutant fruit pod on the label and you can hardly blame me for not recognizing the source of my turon ingredient. Now I know better. I tasted fresh jackfruit during a visit to the Salcedo Saturday Market in Makati and needless to say, it was wonderful. The flavor of langka has been variously described as akin to bananas or pineapple but those descriptors ignore texture; to me, it is more like a very firm mango in both color and taste. Due to that firmness, it holds up well to cooking; in Filipino cuisine, it is used in both savory and sweet dishes, especially those using the ginata method (cooking with coconut milk), and is a common flavoring for sweet pastries and candies. Aside from banana turons, I haven't made any other Filipino dish with langka so I decided to incorporate it into a decidedly all-American baked good: the muffin. If you've never had jackfruit before, this makes a mild yet delicious introduction. The base muffin recipe comes from the Pillsbury Complete Book of Baking, with some adjustments to make use of the langka syrup. 4. Combine wet and dry ingredients, and add chopped langka. Mix just until dry ingredients are moistened; batter will be lumpy. 6. Cool before removing from pan. Optional: I topped the muffins with slices of ripe plantain and a sprinkling of brown sugar and chopped walnuts. Leapin' langka - these taste so good! I didn't know about langka, thanks for sharing! Very interesting! Daily Spud - They're so surreal in reality! I know that melons and squash are often grown to monstrous proportions for competitions but this is a normal size for these fruits. For my next bit of research, I'll have to find out how they pick these suckers. 5 Star - You're welcome! I must admit, I find them more fascinating because of the size disconnect between the whole and canned fruit. Those are humongous! Bigger than watermelons. The muffins look divinely yummy!! Reeni and Heather - Thanks! They're really something else. I've never had jackfruit before, but I've heard that they're quite delicious. Sara - If you come across it in the Asian section of your local supermarket or at an Asian grocey, definitely pick it up and give it a try. Use it as you would peaches, apricots or mangoes. Have fun with it! Chef E - Thank you so much for tagging me - my very first!! I'm going to put it together and post in a few days. In the meantime, I'm working on one of my resolutions - I'm ID'ing new recipes to try each week. Wish me luck! It's so funny how the names are so similar, just one letter off. Because Tagalog draws from Old Malay language, I sometimes feel like I'm on the verge of understanding what a Malaysian is saying even though I don't know ANY words (except food-related) in Malay! Noodle, you are wonderful! I miss jackfruit SO SO much and have not been able to find it here. Maybe I need to look harder. I haven't had it since 1974, I was 9 and we lived in Brazil. Food seems to haunt me! LOL!! I can't wait to try this recipe! THANK YOU! The next time I stop by the Asian market I'll have to look out for jackfruit. Those muffins look divine. I'm so glad you showed pictures of the inside! I see jackfruit at the farmer's market in Brazil all the time. I knew the name (I think it is jaca in portuguese), but had no idea what to do with it or what it looked like inside. They never cut them open. Thanks for the history. We also see them hanging from incredibly tall trees in the park where we walk. They are massive. A bit scary too. :) Thanks for the muffin recipe. If I can get my hands on some of the cleaned fruit I will try them. I don't see myself carrying a whole one on the 20 minute walk back to our apartment. Ha, ha! I would have been shocked too. It's sad that we as a society are so removed from our food. I had never even heard of a jackfruit before I read this post so you're one step ahead of me! Chef Bliss - Enjoy! 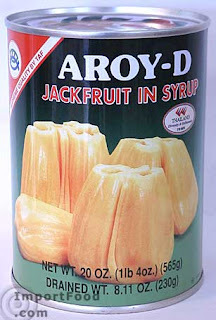 Most brands of canned jackfruit are Vietnamese or Thai (at least the ones I find here in MN) so if your local Asian groceries stock by country/cuisine, they're good places to start. And, wow - Netherlans, Brazil . . . sounds like you were already a world denizen as a child! 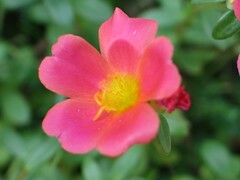 Lauri - Thanks! I decided to top them give them a little more 'oomph'. A brown sugar-nut crumble seems to pair really well. Lori - Glad to the pictures helped! At least you knew what they actually looked like on the outside but I'd be scared to walk near the trees for fear of falling fruit! Now, even if you did get a whole one back home, I understand that removing the edible portion involves coating your hands w/oil or using gloves - the white portion excretes a gooey, viscous substance that is actually used as a type of glue! Yikes!! Joie - I was quite embarrassed to realize that I didn't even know what the whole fruit looked like and I've been eating it since childhood! While we were in the Philippines, an acquaintance who'd lived in the US briefly noted that meat and fish here are visually sanitized for the consumer - already butchered, filleted, with few indications of the source's original form. Ioyces - Great to hear from you and thanks! Another similarity in names from different languages - maybe it's indicative of the trees' migration across Asia with the name being reinterpreted in new places. Cris - I wish I could have seen the trees! I wonder why it's not as popular in Brazil which is one of only 2 countries in the Western Hemisphere where jackfruit trees are grown extensively. As for the canned version, it's probably not as common b/c you can get it fresh! Have a great time at the beach!! by the way, you need to blog about how amazing mangoes taste like in the philipines. Kang - I'm still in awe over their size. As for Philippine mangoes, my mom has been bragging about them for years and I was finally convinced during our recent trip. But I have to spread the love - I have some South American friends who'd beg to differ on who grows the tastiest mangoes. so this is jackfruit - looks like an overgrown marrow, glad to hear it's much sweeter than a zucchini! Mediterranean kiwi - The benefit of having been introduced to this fruit via a canned product is that it went straight to the tasty-looking part! Otherwise, seeing it's original form, I might have shied away. Just thought I would let you know that I finally got myself a tin of jackfruit yesterday (exactly the one you have pictured in your post - gosh I love the Asia Market we have here) and made your muffins. I've just had a late breakfast of coffee and, um, several muffins (I wouldn't like to say how many - lets just say I should really go for a walk now :) ). I liked that they were mild and not too sweet - that's how I like my muffins! Am enjoying getting to know jackfruit too. Definitely akin to firm mango and with a bit of a pineapple-y taste. Mmmmm. Daily Spud - That's great! I'm so happy to hear that you enjoyed them. There are some recipes I'm considering for jackfruit in a savory dish but I'm a little hesitant: I don't want to 'ruin' my taste for them if it turns out weird! I need a good dose of your sense for culinary adventure! Jude - Thank you for stopping by! I'm happy that the post gave you a chance to reminisce. Tagaytay was a highlight of our trip and I definitely want to return. Cris - The taste and texture does take some getting used to. Lori at Fake Food Free, who lives in Brazil as well (I should ask her where), says she tried it recently for the first time at a feira (did I spell it right?). She like the flavor but noted that the firmness might take some getting used to. Growing up on a farm, you must have tasted food in its freshest state. Like jackfruit, there are so many things that I've experienced only after it's been processed. Manang - When I tasted the fresh ones at Salcedo Market, I knew that the canned version will always be second best. It's all I have, though, so I'll make the best of it. Have you ever made it in a savory dish? If so, I hope you'll share a recipe! I thoroughly enjoyed reading your post on the langka. I used to live in Vietnam for a long time, and one of the things I was often struck by the was how jackfruit tended to feature prominently on the premises of Buddhist temples. Whenever I visited a temple, there always seemed to be jackfruit hanging like giant alien pods from trees -- if one of those things dropped on you from a high branch, you'd surely have the life crushed out of you -- and much of the temple's wooden architecture, and many of its religious figures, were fashioned from jackfruit wood. I wonder if jackfruit wood is used very often in the Philippines? Anyway, great post! I hope to try your langka muffin recipe this weekend...Yum! Sapuche - I wonder if the jackfruit has any particular meaning or symbolism to the temples, or if it's simply a case of the most abundant material close by? I don't know if the wood is used as commonly in the Philippines although I was very impressed by how Filipinos make a concerted effort to use and re-use all available materials. I've brought home bags and decorations made from leaf fibers to newspapers and even cigarette foils! I hope you'll enjoy the muffins. After tasting fresh langka, I'm bummed that I can't find any but the canned variety - still, something is better than nothing. Kudos to the first brave soul who saw past the freaky exterior and took a taste of the fruit! I tried your muffin recipe tonight and they turned out great! Like Daily Spud mentioned, they weren't overly sweet and the jackfruit taste was mild. Although I used canned jackfruit for the recipe, I bought fresh, too, to use in a Vietnamese "goi" salad. I'm lucky to have such a great Chinatown here. Speaking of huge fruits, the section I bought came from one that was easily a meter long. It looked like a side of crocodile lying on the shop's cutting board. Thanks for posting this recipe. Sapuche - You're welcome and thank you for trying out the recipe! I'd been living in jackfruit ignorance for so long, it was shock to see the real thing! I envy your Chinatown and access to a variety of ingredients. It's a little tought here in MN to find fresh varieties of fruits, vegetables and seafood used in Asian cuisine. When Life Hands You Lemonade (Awards) . . .